MOSCOW, Idaho – A long-awaited report on the University of Idaho’s handling of sexual assault and harassment complaints five years ago contained no startling new information and offered conclusions that have been debated on the Moscow campus since this spring. The university was slow to ensure its appropriate staff and administrators learned of new federal Title IX policies that outlined the university’s responsibility to investigate complaints about incidents that occurred off campus, and a Moscow Police liaison officer gave UI officials incorrect information that they could not investigate such complaints. Rob Spear, Idaho athletics director, relied on this defense to excuse his response to former Vandals diver Marin Jameson’s charge that she had been harassed and assaulted by a former UI football player. Jameson said Spear did not treat her complaint with the proper seriousness and was defensive when called out on it. “We believe if Dr. Spear had made the same effort as his head football coach by apologizing in person and without trying to explain how the university failures caused him to respond inadequately, the university might not have to address these issues five years later,” the report’s authors, Dan Beebe and Pat Olsson, wrote. They are independent consultants hired by Idaho. Once Jameson agreed to pursue charges, the system largely operated effectively, the consultants say. Police were able to investigate her complaint against Jahrie Level, and security camera video from a Moscow nightclub confirmed her allegation Level had reached under her dress and inappropriately touched her. Level was removed from the football team the next day and subsequently expelled. Idaho’s women’s athletes and women’s sport coaches who spoke on Spear’s behalf this spring were not coerced by him into doing so. The university’s structure for handling assault and harassment complaints is significantly improved from what it was five years ago, in part because Spear took the lead in getting training for the athletics department in the wake of the complaints by Jameson and Maggie Miller, a track athlete, against the football player Level. He acknowledged “the litmus test” of UI’s procedures is applying them to actual cases. But Staben, who came to Idaho in 2014, agreed with the report’s conclusion the university is in a better place now than it was five years ago for dealing with such issues. Staben noted students all receive “think about it” training designed to interrupt events sliding toward sexual assault, and faculty and staff have been trained in their responsibilities in dealing with complaints and ensuring they are reported to the dean of students. The UI has also reorganized and increased staff for investigating such complaints. Beginning with the fall semester, Idaho will convene a task force on campus safety and wellness, led by dean of students Blaine Eckles, and it will conduct a campus climate survey on those issues. “The safety and security of students is always a high priority,” Staben said. Staben placed Spear on a 60-day administrative leave pending the completion of Beebe and Olsson’s report. That leave was subsequently made open-ended in late May when the report was not yet finished. In the interim, the Idaho State Board of Education, that also functions as UI’s board of regents, decided to terminate Staben’s contract as president at the end of the academic year. In light of that move, the board decided it and not Staben should determine if Spear can return to his job as athletics director. No announcement about Spear has been forthcoming from the board, though. This month the board held two lengthy executive sessions on Spear’s situation but emerged from each without going into public session and voting on whether to retain him. The Beebe and Olsson report was submitted to Idaho on July 16. Mike Keckler, the board’s spokesman, said he does not know if board members had access to the report during their closed deliberations. Keckler said Wednesday the board has not scheduled a third executive session – it must give 24-hour notice if it does – and the next regularly scheduled board meeting is Aug. 15 in Pocatello. 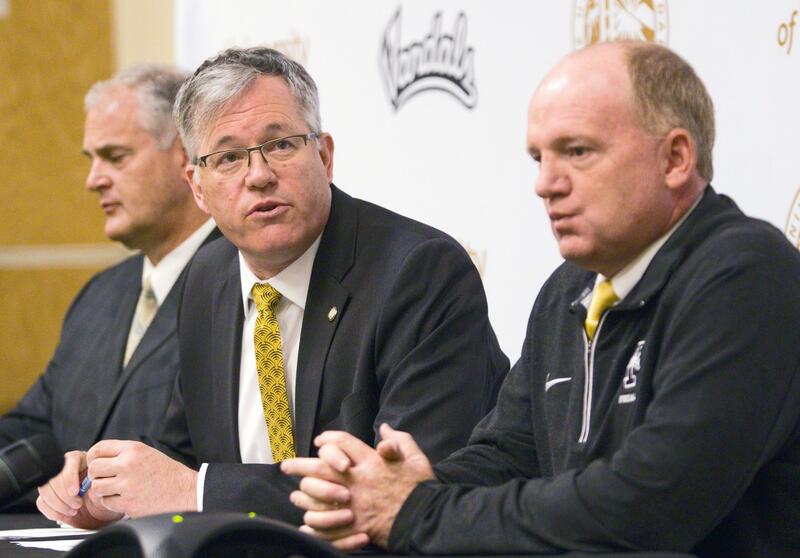 In Spear’s absence, associate athletic director for revenue generation and executive director of the Vandal Scholarship Fund Pete Isakson has served as interim athletics director. In that capacity, he has already had to hire one coach, new women’s soccer coach Jeremy Clevenger. But a letter to Mike Mai, first vice president of the Vandal Scholarship Fund, purportedly drafted by unnamed “Concerned University of Idaho coaches, staff and student-athletes” suggests the department is fracturing over Isakson’s leadership. Staben said he has not seen that letter. But he gave Isakson a vote of confidence. “I think Pete is doing a good job under difficult circumstances.” Staben also said he is “not particularly” concerned the board has drawn out its decision. Published: Aug. 1, 2018, 9:10 p.m.